GRAND OPENING & Sausage Sizzle – 12th July 2013…Your Invited! Thanks to the loyalty and support of our customers, business is booming! 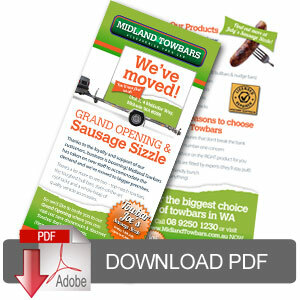 Midland Towbars has taken on new staff to accommodate the demand and we’ve moved to bigger premises. There’s a lot more to see too – top-notch towbars, the toughest bull bars, state-of-the-art roof racks and a whole heap of quality vehicle accessories. Download your invite here and make sure you come along for a fun day.